This was not the best year for my garden. You already know about my zucchini troubles but those were only the beginning. My tomato plants, as well as those of my neighbors, just didn’t do well. Yes, I harvested cherry tomatoes but nowhere near as many as I have in prior years. The San Marzano tomatoes were no bigger than 1/4 of their normal size, while the Brandywine didn’t even bloom until mid-August. I gladly yanked them out of the ground during the 1st week of October. On the other hand, my eggplants did far better than I ever imagined and I have trays of eggplant lasagna in my freezer to prove it. I picked the last of the eggplant on about Halloween and sadly cleared those plants from the bed. Left standing were the chile/pepper plants. They, too, produced a great deal right up until the morning of November 11th, when everything was picked from that raised bed but I held off pulling them because there were still peppers ripening. That morning, I took stock of this season’s pickled pepper inventory. There would be no more pepper pickling this year. Great! Now, what? Well, I did what most of us do under similar circumstances. I called upon Mr. Google. First, I checked to see whether green peppers would be as hot as fully ripened red peppers. I was swamped with every reply imaginable. Yes, green peppers are just as hot. No, they’re much more mild. They’re the same but red — no, make that green — are sweeter. The only response I didn’t see was that young peppers were inedible or, worse yet, poisonous. So, I went searching for a recipe. I chose today’s recipe because it was so simple to prepare and, best of all, I already had all the ingredients. There would be no mad dash to the grocery today! So, here’s the relish recipe that I followed. To prepare the peppers, all I did was remove the top of each, leaving the seeds and ribs intact. I did nothing to limit the heat of the relish. The result? One spicy relish but not so hot to ruin your palate midway through the meal. Perfect. Add the remaining ingredients into a saucepan and bring to a boil before simmering for a few minutes. Lower heat to keep liquid warm. Fill clean, sterile jars with the chopped chile mixture. Remove the garlic before adding the hot liquid to each jar, filling to 1/2 inch (1.25 cm) from the top. Seal each jar until “finger tight”. (See Notes). Place in a boiling water bath for 15 minutes. Start the timer after the water returns to the boil. Remove from the bath and place atop a clean kitchen towel away from drafts. Do not disturb for 24 hours. Based on the recipe, “Hellish” Hot Pepper Relish, by BKLaRue. When dealing Large quantities of peppers and chiles, be sure to wear rubber gloves and do not touch your face as long as you’re wearing them. If you choose not to wear gloves and absent-mindedly rub an eye, I guarantee you’ll wear them next time. This recipe resulted in 4 pints of relish but can be easily adjusted to suit the amount of peppers on-hand. Just be sure to maintain the relative amounts of the vinegars, sugars, and salt. The rest of the spices can be changed to suit your own tastes. 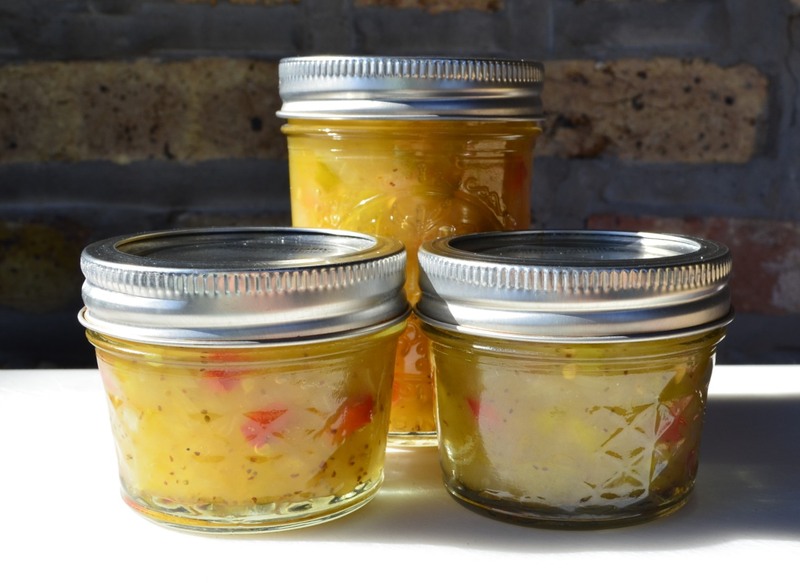 Relish that has been properly preserved will last up to a year on a dark, cool shelf. Refrigerate after opening, however, and use within a few weeks. You needn’t preserve the relish. If you prefer, it can be prepared as described and then refrigerated rather than being further processed in hot water. Be aware that relish stored in the fridge will remain good for a few weeks and not a year like its preserved counterparts. On the plus side, relish stored in the fridge will retain its vibrant colors and crispness. Our weather was most unseasonably warm when I wrote this post so I did not pull my pepper/chile plants right away. In fact, they remained until after the first killing frost during the early morning hours of November 20th. As a result, I had another batch of peppers to pick from which I made 2 half-pints of relish, though neither was processed and preserved. Call them a “Quick Relish.”, if you like but, whatever the name, è finito! If you find that a jar has not sealed properly during processing, just store it in the fridge and use as you would a jar that you’ve opened. For information regarding canning/preserving, please refer to the USDA Principles of Home Canning guide. For information on preserving virtually any/all vegetables, fruit, and berries, be sure to check out the Pick Your Own website. A few weeks ago, when I shared our recipe for Olio Santo, that post’s look back took you to our recipe for tomato ketchup. Well, with today’s recipe a relish, why not take a look back at one of the honey mustard recipes that I shared a couple of years ago? It’s a great little recipe and if you prepare gift baskets for the upcoming holidays, these 3 condiments make perfect additions to accompany the Olio Santo. You can see how we make honey mustard by clicking HERE. I was introduced to Olio Santo during my first visit to San Marino a little over 2 years ago. My cousin Maurizio offered to drizzle a bit of it on my linguine alla vongole, a dish Zia had prepared for me after I mentioned it was a favorite. I thoroughly enjoyed the oil and was told that Zia made it and that it was very easy to do. After a brief explanation, I knew that I’d be making it once I got home. I have ever since. Red peperoncini are grown throughout Southern Italy but primarily in Calabria and Basilicata, the toe and instep of the Italian boot. Come August, you can often see the peperoncini hanging in large bunches, drying in the hot Mediterranean sun. Across the south, their name often contains a reference to the devil – i.e., diavolett, diabulillu, diavulicchuirefers, etc. With that naming convention, it makes perfect sense that an oil made with them should be called holy or sacred. Olio Santo does, in fact, translate to Holy Oil. Yes, perfect sense. Trying to find the origin of Olio Santo was not such an easy task. It seems that everyone from Calabria to Abruzzo (the region to the south of Le Marche), claims to be the origin of this spicy condiment. I’m not about to take sides. For me, Zia Pina is the creator of Olio Santo. You see, in Zia Pina I trust. Zia uses dried red peperoncini from Calabria to make her Olio Santo. She grinds/chops the peperoncini, places them in a bottle, fills it with good quality olive oil, and caps it before setting the bottle in the sun for 3 days. After sunbathing, the bottle is stored in a cool, dark place for at least a week. Feel free to use it after that. (See Notes) It really is that simple and the recipe I’m about to share adds quantities to the ingredients just mentioned. Although Zia uses Calabrese peperoncini, you may not be able to source them. For some time, I had a devil of a time finding them and eventually turned to Amazon. Of course, you needn’t go to such lengths but can easily use the more readily available chilies from this side of the Atlantic. I’ve used dried Chile do Arbol with a dash of red pepper flakes when peperoncini aren’t available. The preparations taste the same and affect the same area of the palate. I honestly doubt whether anyone would notice a difference. Once made, use it as a finishing oil for just about any pasta dish to add a little zip to the plate. I’ve used it as a base for spaghetti aglio e olio, as well as a dipping oil for some crusty Italian bread. You may want to add a bit of grated Parmigiano Reggiano to that plate, too. Remember the pinzimonio? A dash of Olio Santo to the dipping sauce will bring a bit of heat to your veggies. Make a batch of this flavorful oil and I think you’ll be surprised to see just how many uses you’ll find for it. And we’ll have Zia Pina to thank. Place the dried peperoncini into a food processor and pulse until thoroughly chopped. Alternately: use a sharp knife to chop the dried peperoncini. Wear gloves to limit the risk of a burning eye. 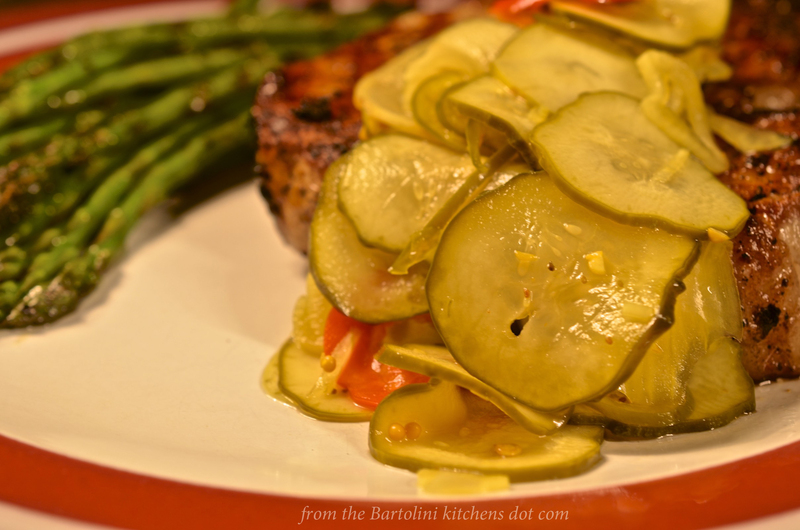 Place the chopped peperoncini into a clean & dry glass container with a tight-fitting lid. Add the olive oil, stir to combine, and place the lid on the jar. Once sealed, place the container into a sunny spot, where it will remain for 3 days. Olio Santo will keep for months, although it never lasts that long. I stir the peperoncini in the oil several times while it sits both in the sun and in the dark. Not only will this ensure that all trapped air bubbles are released, I think it gives all the chopped peperoncini equal access to the oil. I always include some chopped peperoncini in each serving bottle I fill from a batch of Olio Santo. If you don’t wish to do so, just pass the oil through a mesh strainer as your fill the bottle. Using a small ladle, I remove any bits and seeds that may float to the surface of my Olio Santo. If allowed to remain, they may block the bottle’s pourer, only to release at a most inopportune time. Your Olio Santo will keep for 6 months, even longer if you continue to refill it with oil after you fill the serving bottle(s). Once soaked, however, I never allow the chopped peperoncini to be exposed to the air. When the level of oil in the bottle drops that low, either add more oil or toss that batch’s remnants. It’s easy enough to make a fresh batch. Some prefer to keep the Olio Santo in the fridge. If you choose to do that, keep in mind that the olive oil will thicken considerably when cold. You can get around this by substituting a neutral-tasting vegetable oil for an equal amount of the olive oil, or, by removing the serving bottle from the fridge about 30 minutes before it’s needed. There are other ways to prepare Olio Santo. Some use chopped, fresh peperoncini, while some recipes steep the peperoncini in heated — not boiling — oil. Never having tried any of them, I cannot say much more about them. I can say, however, that I’m sticking with Zia Pina. One good condiment deserves another, eh? A few years ago I made my first batch of ketchup and haven’t bought a bottle since. It’s good enough to have earned a permanent spot in my Christmas gift baskets, too. Better still, it’s not just for fried potatoes or burgers, as I’ll prove in a soon-to-be shared meatloaf recipe. Take this LINK to see the recipe and then you’ll have no excuse for not being prepared to make a killer meatloaf in a few weeks. If it’s Mid-Summer, it’s Time for Pinzimonio! I remember this dish every year — but around Thanksgiving, long after the gardens have withered and the farmers markets have closed for the season. Sure, you can make this dish anytime but it’s best when the vegetables are freshly picked. So, what is pinzimonio? It’s a variety of fresh vegetables served raw with a side dressing of olive oil and vinegar that’s seasoned simply with salt and pepper. (Yes, that’s crudités but I hesitate to bring a third language into the discussion.) It’s easy enough to prepare and a great way to take advantage of summer’s bounty. When I was a boy, Mom would serve pinzimonio just about every Sunday starting in July, when the first of our garden’s crop ripened. As we gathered for dinner, there would be a platter of cut, raw vegetables in the center of the table waiting for us. You might find bell peppers, fennel, celery, carrots, radishes, cucumbers, and scallions, along with whatever caught Dad’s eye when he took Sis & I to the grocery that morning. Rounding out the antipasti/insalati, she’d also serve a platter of freshly picked, sliced tomatoes (See Déjà Vu). But wait! There’s more. At each of our places at the table, Mom would have a ramekin with our own dipping sauce which she would cater to our age and preference. All contained oil and red wine vinegar but those for Sis and I, being the youngest, contained just a touch of salt & pepper. My brother, being so very much older (this is one way to see if my siblings read the blog), was allowed more salt and pepper in his dipping sauce. Mom, having a life-long aversion to pepper, gave herself barely a few pepper flakes with the salt in her ramekin. Dad had no such issues and you could see a thick layer of salt with another of pepper covering the bottom of his little dish. Each of us helped ourselves to whatever we wanted on the platter and dipped it into our own ramekins. No need to pass this or that and, best of all, we could double, triple, or even quadruple dip without so much as a raised eyebrow from Mom. Now, as for a recipe, well, I’ve pretty much explained the dish already. Gather together any fresh vegetable that you would serve dressed with an oil and vinegar dressing. Clean and trim each in such a way to accommodate their serving and arrange them on a platter. Next, place oil, vinegar, salt and pepper in ramekins or small dishes, one per place setting. Although Mom always used red wine vinegar, I’ve used balsamic and loved it. No matter the vinegar used, you’ll find that pinzimonio is a great way to take advantage of the bounty of summer, while adding more vegetables to your diet. Not only that but if, like me, you have meatless days, pinzimonio makes a great lunch or dinner, especially when summer’s heat renders the stove off-limits. I could hardly write about pinzimonio without offering you the link to Mom’s Tomato Antipasti. This time of year, both dishes were usually served side-by-side, much to the delight of all seated at that table. Best of all, it’s an easy dish to prepare and, like pinzimonio, no stove is required. Here’s the LINK to one of my family’s favorite summertime antipasti. This being such a short post, I thought I’d take advantage of the opportunity and share a bit of our holiday last spring. My trip began in Bologna, a wonderful town with an incredible history. It is home to the world’s oldest continuously operating university and the center of what many believe to be the heart of Italian cuisine. With my nephew arriving the next day, I had barely enough time to check into my room, take a walk, break my camera, have a great dinner, and get lost on my way back to the hotel. Yes, you read that correctly. My camera was out of commission for the entire trip. Let me apologize now for the quality of the pics to follow. Truth be told, I hadn’t planned on posting many because most would be very similar to those posted 2 years ago. Even so, it would have been nice to have had a good camera with me. Many of Bologna’s walks are covered and the “pavement” is marble. The city is meant for the casual promenade. Besides several churches and the university, there are a number of sites to see: the Two Towers, the Piazza Maggiore (site of my camera’s untimely demise), the statue of Neptune, and of course, my prosciutto store, La Prosciutteria. How I love that place!!! Here are a few photos. Click on any one to see a full description. That day ended with one of the best restaurant meals that I was served. My nephew’s plane arrived on time and soon we were on our way to San Marino, where Zia Pina greeted us with open arms, Waiting with her was her grand-daughter & husband, and the newest member of our the family, the soon to be one-year-old Viola. Zia is a wonderful cook and the highlight was when she served cappelletti for the entire family. This just so happens to by my nephew’s favorite dish and one he hasn’t enjoyed since his Grandma, my Mom, passed away 14 years ago. The following day, she took us both for a tour of the city of San Marino, and the seat of the republic’s government atop Mt. Titano. The next day, Sunday, we attended a mass that Zia had arranged to honor our family’s departed. Afterward, we re-assembled at a restaurant In Riccione, on the Adriatic shore, for a fantastic seafood feast. I would go back there in a heartbeat! Here are just a few of those photos. Piazza della Liberta with the Palazzo Pubblico, the seat of the Government. Before leaving San Marino, my nephew and I “kidnapped” a young cousin for a day trip to Venice and Murano Island. It was a chilly day with showers, so, we timed our lunch and a caffè for the worst spells — or so we tried. Although we knew it was the Italian Liberation Day holiday, we didn’t know that it was also St. Mark’s feast day, he being the Patron Saint of Venice. We learned of our oversight upon setting foot upon St. Mark’s Square. Even so, we had to keep moving and, after a water taxi ride to Murano Island for a bit of souvenir shopping, we ended our day with a fine supper. Then it was a dash across Venice for a train ride back to Rimini where a cousin would take us to Zia’s. (I won’t mention that our arrival was delayed because we missed our train and, consequently, were stowaways on the next.) Thankfully, our “chauffeur” was very kind and waited patiently for our eventual arrival. These next photos are by committee. Oddly enough, each of our phones, ran out of power as we traversed Venice. Mine was the first to go, only to miraculously revive — its vibrating giving me quite a start — on the train as we approached the station in Rimini. The western end of the Grand Canal, with the Santa Lucia Station on the right. Don’t let the blue skies fool you. We were drenched by the time we reached the piazza and there wasn’t a soul seated in any of the cafés that encircle it. The next morning, my nephew and I boarded a train bound for Rome, with Zia and 2 cousins accompanying us. What fun! Our flat was about 100 yards from the Pantheon and once we settled in, we were off for a little sightseeing around the Piazza Navona. That night, we enjoyed a fine dinner in celebration of my nephew’s graduation and, as we soon learned, my cousin’s wedding anniversary. The next morning, we walked to the Vatican to meet another cousin and her husband. Unable to get into the Vatican because the Pope was awaiting a diplomat, we took taxis to the Colosseum, stopping along the way for lunch. Well, by the time we made it to the Colosseum, it was far too crowded with tourists to enter. We headed back to the flat, said our goodbyes, and our cousins headed to the train station for their ride back to San Marino. Alone now, with only 2 days left, we planned the rest of our stay. We would spend one morning revisiting the Colosseum, with the Vatican occupying the second. The afternoons would be spent seeing everything on his “must see” list, as well as a couple of sites that I tossed into the mix. Of course, a fantastic meal would end each day. Lunch in Rome, our last meal together. Friday lunch: Pizza Montecarlo – Proof that everything is better with an egg on top. In what seemed like the blink of an eye, it was time for us to part company. My nephew returned home but a few weeks earlier I had decided to extend my holiday. I wanted to take a few days to visit Corinaldo, the Bartolini ancestral home. So, as my nephew boarded a plane, I caught a train to Ancona, where I rented a car for the drive to Corinaldo. It’s a quaint little village nestled in rolling hills. The very center of the town is totally encircled by walls that were built during the 1300s. Unlike similar towns in Italy, these walls have been maintained and are in excellent condition. There is but one entrance and one exit, the knowledge of which might have saved me the hour I spent circling the area, not to mention one ill-fated attempt of entering through the exit. (Ah! The joys of travel.) Once situated, my flat was quite nice with a terrace facing west and I was anxious to watch the sun set over the Italian countryside. Well, that was the plan but the clouds had made previous reservations, apparently, and I never did see a sunset. No worries. I still enjoyed my time there, walking from one end of the village to the other — make that “carefully walking”. It rained intermittently and the cobblestone streets are quite narrow. I rushed for a doorway or hugged a wall whenever I heard a car approach. Luckily, that didn’t happen very often. There is no rush hour in downtown Corinaldo. There is, however, a great little restaurant on The Stairs and they served me my final meal in my Grandparents’ hometown. This way for parking. Proceed with caution. I left the next morning taking a route to Ancona that would allow me to travel along the Adriatic coast for a spell. To get to the coast, I travelled along narrow roads that carried me over the hills, through the beautiful Marche countryside. I dropped off the car and made my way to the train station. With an early morning flight, my destination would be Fiumicino, a small town about 30 km outside of Rome and home to the city’s international airport. Lucky for me, there was a wonderful restaurant just down the street from my hotel. My holiday ended with one last fantastic meal, albeit a filling one. Along the way to Fiumincino during the last train ride. Unbeknownst to me, I spent my holiday walking with a stress fracture of my left ankle. It had bothered me before I left but I made a variety of excuses about it. In fact, even upon coming home, the excuses continued. Finally, about a week later, I decided to have it checked and I was given this fancy boot to wear for the next 4 weeks. WIth the boot now gone, I am happy to say that things are back to normal, whatever that means. You won’t find this at Ferragamo’s. Our holiday was memorable in so many ways, and during the course of which, my now-adult nephew and I became re-acquainted. We were treated royally, with our family members freeing up their schedules so that they could spend as much time with us as possible. I’ve read that when we put to paper an objective, the odds of accomplishing it increase by 40%. With that in mind, I do not know how or when but I will be returning to San Marino. I must. I’ve promised to kidnap another cousin for a day trip somewhere. Like many, several weeks before the holidays each year I make a list and budget for the gifts I intend to buy for family and friends. (Sorry, but there’s something seriously wrong with people who proudly declare that their shopping is done on September 1st.) At the very top of my list is the same name each and every year. That name is mine. Most years, I buy myself a gift before buying anyone anything. You want to get into the Christmas spirit? Buy yourself a gift first thing. Works like a charm. This year I really didn’t know what to buy myself. I had just survived a rather expensive period and didn’t want to splurge on anything major. I had seen a spiralizer attachment for my stand mixer but it seemed a little expensive and I wondered if I’d really use it. The internal debate ended when the piece of equipment was on sale for 25% off with free shipping. It wasn’t long thereafter that it arrived and, well, it was love at first sight. We’ve been happily at work together ever since. Before getting into today’s dish, understand that hand-cranked spiralizers are available and can easily be found on the internet. I’ve no experience with any of them but I do enjoy using my stand mixer’s attachment. In less than 10 minutes I have a large bowl of vegetable noodles and the removable parts can safely be washed in the dishwasher. All of its parts fit into a form-fitting box that can be easily stored on a shelf or in a cupboard. In short, I like it far more than I thought I would. Though I’ve tried several recipes, we’ll start with the simplest of dishes, Zucchini Noodles with Pesto. To begin, make your pesto. If you haven’t a recipe, you can check out my recipe for Pesto Genovese. In today’s recipe, not wishing to pay the exorbitant prices for imported Italian pine nuts, I used an equal amount of roasted walnuts instead. I saved a few more for garnish, as well. I also use less oil than most recommend and that will affect things later in the recipe. With the pesto made, now turn your attention to the zucchini. I’ve found that it’s best to buy squash that are as straight as possible and medium-sized. The instructions for my spiralizer recommend using pieces of vegetable that are about 4 inches (10 cm) in length, although I’ve used lengths a little more than that. There’s no need to peel the squash so you should pick vegetables with relatively unblemished skins. I’ve used both yellow squash and green zucchini but, to tell you the truth, it’s not easy to tell which is which in the finished dish, especially when dressed with pesto. All that’s left to do now is to assemble your dish. First, take a handful of halved cherry/grape tomatoes and toss them into the bowl of noodles. Since my pesto is thicker than most, I sprinkle a little olive oil – about 1 tablespoon – over the bowl’s contents and gently toss until evenly coated. Now all that’s needed is the pesto. Add as much as you would to any pasta dish but, initially, it’s better to add less pesto than you think necessary. More can always be added but there’s nothing to be done once too much pesto has been added to a dish. Prior to bringing the bowl to the table, garnish with the reserved toasted walnuts and some grated Pecorino Romano cheese (Parmigiano Reggiano may be substituted, as can grated vegan cheese, depending upon what was used to prepare the pesto). This dish could not be easier to prepare and if you’ve pesto on-hand, it can be prepared and served from the same bowl. As one who lives alone, I cannot tell you how very appealing that latter statement is. From kitchen to sofa in 15 minutes, with a clean kitchen in 5 minutes more. Hard to beat that! Cooking some spiralizer noodles can result in quite a bit of excess water in the pan. I avoided the problem here by using raw zucchini noodles. In some instances, baking the noodles will help to rid the noodles of the excess water, as will sautéing so long as the pan remains uncovered. To be sure, this issue will resurface in future recipes. Oh! One last thing to consider. 1 ounce (28 g) of raw zucchini with the skin has about 5 calories and 1 gram of carbs. Compare that to 1 oz of dry spaghetti which has about 126 calories and 24.5 grams of carbs. And that, my friends, is about as close to a negative comment about pasta that you’ll ever get from me — unless it’s over-cooked. In the weeks and months ahead, be sure to come back to see how this love affair continues. Beets, squash, (sweet) potatoes, zucchini, and apples are but a few of the ingredients to be transformed into salads, “noodles”, and casseroles. Admittedly, vegetarian main courses aren’t everyday occurrences on this blog. Since one such recipe was shared today, why not send you back for another, Jamie Oliver’s Zucchini and Penne? Unlike today’s gluten-free noodles, however, Jamie’s dish combines real penne and a close facsimile, smartly cut zucchini. It’s another great dish and one that you can find simply by clicking HERE. If you’re fortunate enough to have a rather large farmers market nearby, you’re likely to come across some relatively rare fruits and vegetables not found in your corner grocery. For me, ground cherries would fall into that category. Also called husk tomatoes, these little fruit will remind you of small sungold cherry tomatoes, except that they wear a thin paper husk, much like their distant cousins, tomatillos. It is their flavor, however, that sets them apart. Oddly enough, they taste like a combination of pineapple and tomato. It is an even mix with neither flavor so strong as to be dominant. I had seen these beauties for years at my farmers market and even asked the vendors about them. Why it took me so long to purchase them is anyone’s guess. I’m just glad that I finally did. Once husked and rinsed, they can be used to make a salsa, like today’s recipe, or cooked to make jam (that recipe is forthcoming). They can also be placed in a single layer on baking sheets and placed in a freezer. Once frozen, they can be packed and kept in the freezer until ready for use. (See Notes) I’ve seen recipes for pies but most combine the fruit with berries and I fear that the additions would overpower these cherries. The fact is that I’m fascinated by the mix of pineapple and tomato flavors and don’t care to do anything to them that might eliminate that contrast. 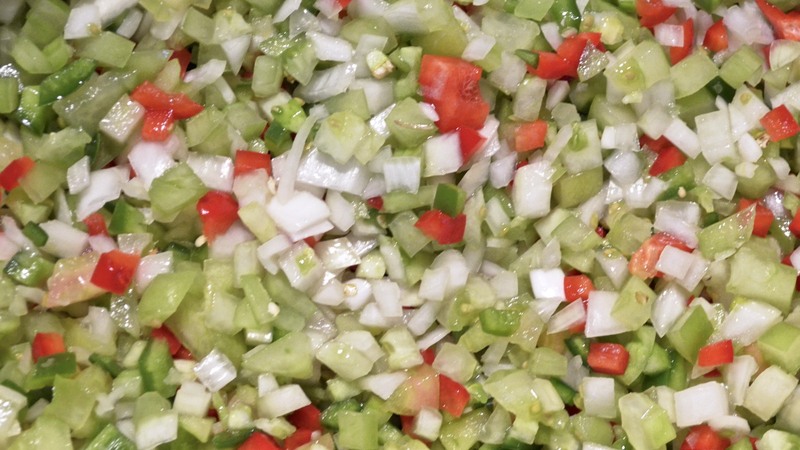 Like any salsa, the ingredients can vary depending upon your personal preference. For today’s recipe, the cherry tomatoes came from my garden and I shopped for the rest of the ingredients in my fridge’s vegetable crisper. I had planned to use a bit of cucumber but, failing to find one, I used celery instead. Where most would use cilantro, I used parsley. I “borrowed” one of Lucy’s green jalapeños and used red onion simply for its color. As you can see, this salsa is a very colorful one. 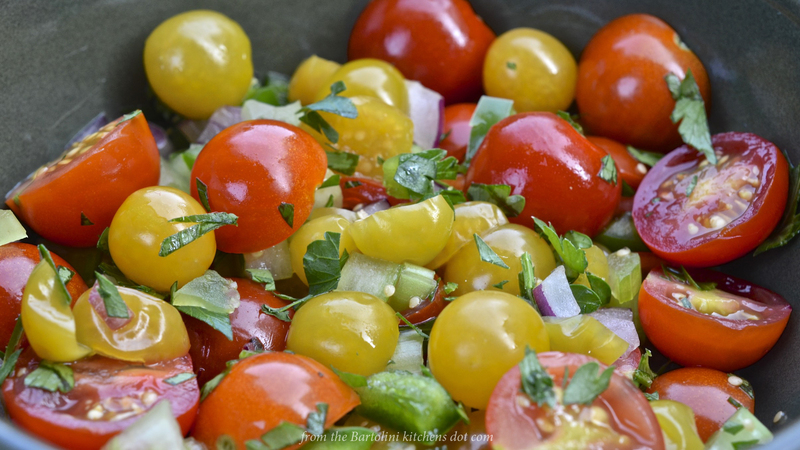 Place the ground cherries, cherry tomatoes, jalapeño, onion, and parsley into a bowl. Gently stir to combine. Add the lime juice and season lightly with salt and pepper. Taste to see if additional lime juice, salt, or pepper are needed. Hulk cherries are an American fruit that are available from mid-July to the first frost. 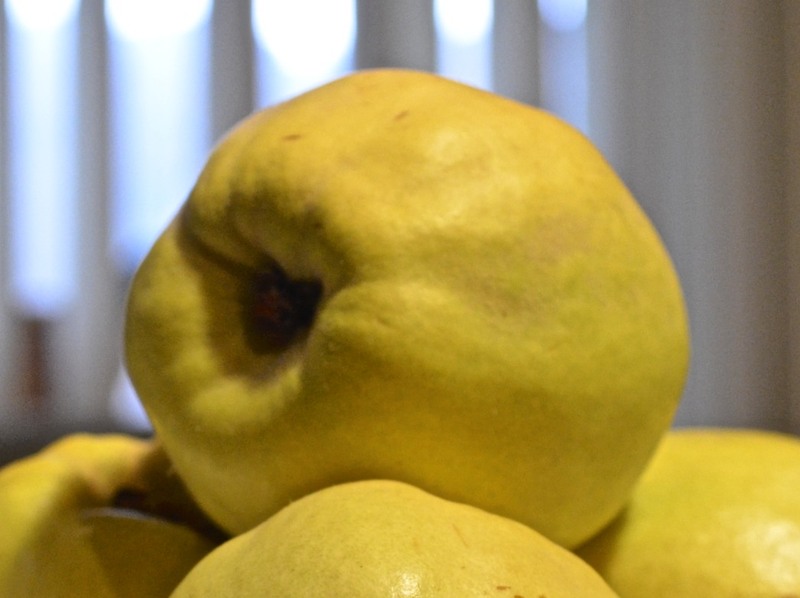 When fully ripe, they range in color from yellow to orange. Green husk cherries should be avoided because they may cause stomach upset. 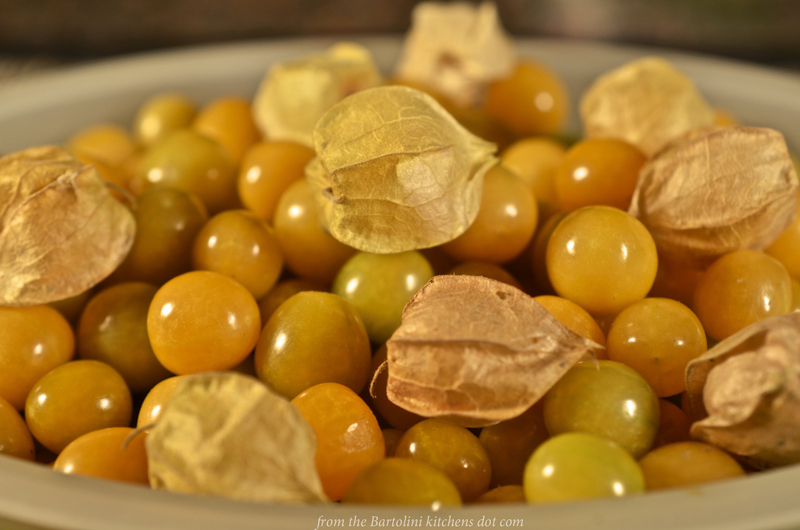 From experience, I’ve noticed that ground cherries, once frozen and thawed, are more soft than when fresh. They are fine when used to make jam but you may not want to use them in today’s salsa recipe. I think they would be fine, however, in a salsa used for dipping chips. The ingredient amounts can be adjusted depending upon how the salsa is served. Since I used this to accompany a fish entrée, I made a relatively small amount. I will be leaving early next week to ferry a very important visitor from her manse in Michigan to my humble Chicago home. As a result, the kitchens will be closed for the next 2 weeks so that I may tend to her every whim whilst she’s here. With temperatures falling, it’s time to start cooking comfort foods. One of our favorites and one that I make for Zia every year is Pasta and Beans Soup, Pasta e Fagioli. Easy to make, this soup is the very definition of comfort. 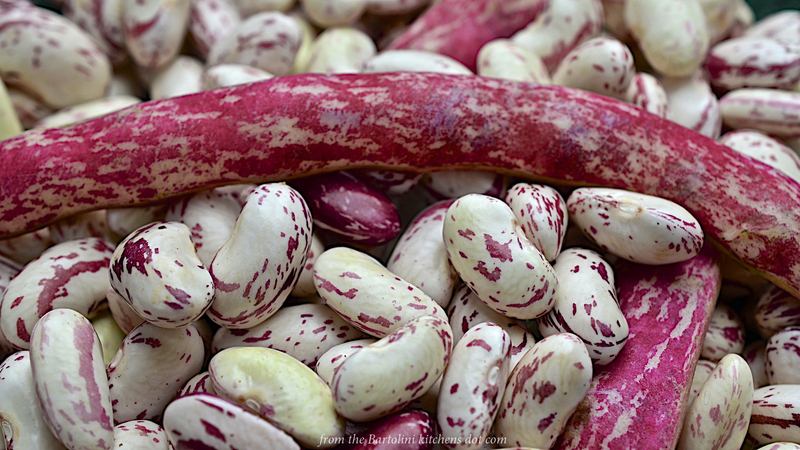 Best of all, if you’re as lucky as I was just last weekend, you can still find fresh Borlotti/cranberry beans at your local farmers market. 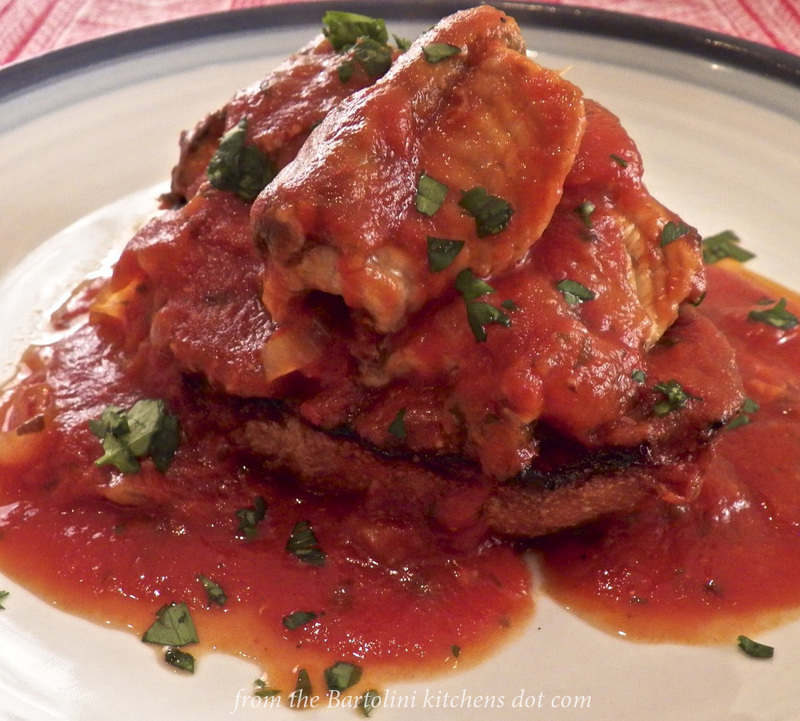 The recipe for this traditional Italian dish can be found by clicking HERE. Every year, just before Christmas Eve, I’ve shared a recipe for seafood, often mentioning the Feast of the Seven Fishes when doing so. To that end, next week’s post will feature another such dish. (See Coming soon to a monitor near you.) Not all Italian families, however, prepare a feast on Christmas Eve. We certainly didn’t when I was very young. My family’s tradition of enjoying a seafood feast didn’t start until a few years later, when Dad would leave the restaurant early, bringing the seafood with him. Prior to that time, our Christmas Eve dinner was nothing special, although always meatless because, being Catholic, meat was not allowed. “Upstairs”, in Zia’s home, baccalà was the main course, with “Nonna”, also, serving today’s soup, garbanzo bean. 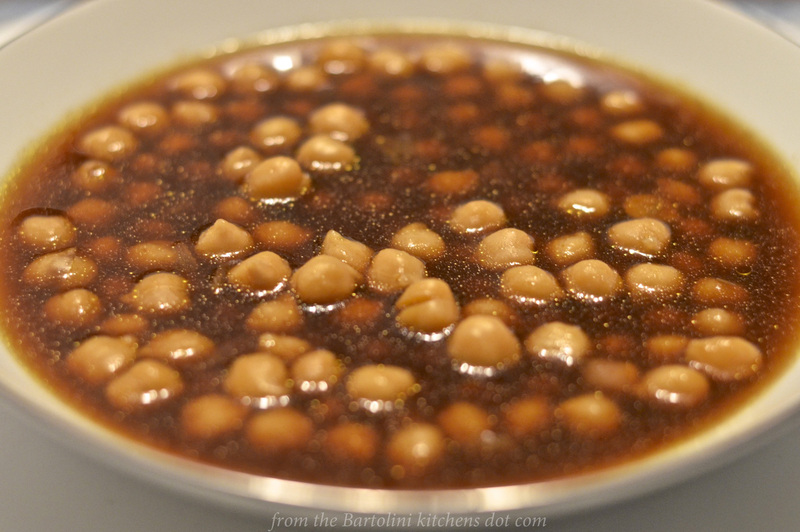 Whether you call them garbanzos, chickpeas, or ceci, this bean is a good one to have in your pantry. Very low in fat and high in protein, garbanzos are becoming more popular as gluten-free and vegetarian diets become more common. Most readily available dried or in cans, garbanzos can be used in any number of ways and, when ground, the resulting flour is a viable substitute for gluten flours. In a country where meat was reserved for special occasions, garbanzos were one of several beans Italians used to supply protein to their diets. As is the case with most of the Bartolini recipes from back in the day, this soup is simple to prepare and relies on a few, commonplace ingredients. As you can imagine, the most important thing you’ll put in your stockpot, therefore, is the stock itself. Here, because the soup was served on Christmas Eve, a day when Catholics were forbidden to eat meat, a vegetable stock is used. Feel free to use whatever type of stock you prefer, though you’ll want to use a rich, full-flavored stock for a soup you’ll be serving on so special a night. At least 8 hours or the night before, place the beans in a large bowl and cover with water that is at least 2 inches above the beans. Before use, pour off the water, rinse, and set aside to drain. Do not allow to dry out. Heat the oil and butter in a large, heavy-bottomed pot over med-high heat. Add the onion and sauté until translucent — about 5 minutes. Do not allow it to brown. Season lightly with salt and pepper. 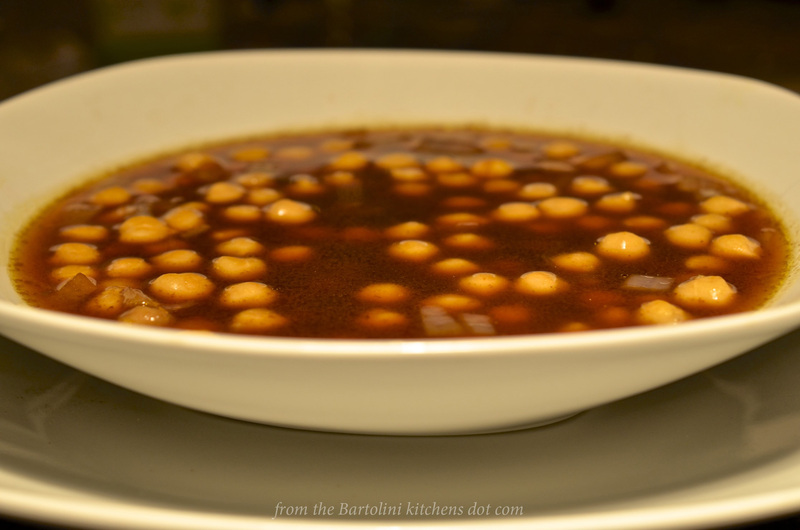 Add the stock and chickpeas to the pot and stir. Bring to a boil before reducing to a simmer. The homemade stock used here was prepared using vegetable odds & ends that I’d been keeping in my freezer. The ingredient list will vary each time the stock is made. In a large stockpot over med-high heat, add 2 tbsp each of butter and olive oil. When hot, add broccoli stems, cauliflower cores, carrot peelings, and asparagus stalk trimmings, as well as a quartered large onion, 3 roughly chopped carrots, 3 roughly chopped celery stalks (leaves included), and a few cloves of smashed garlic. Sauté until the vegetables begin to color. Add a handful of parsley, a quartered tomato (“for color”), and 1 bay leaf before adding enough water to fill the pot. Bring to a boil and then reduce to a simmer. Continue to cook for at 2 hours, allowing the stock to reduce and the flavors to intensify. Occasionally skim the stock of the film that may coat the its surface. If the stock reduces too much, add water to compensate. Season with salt and pepper if you intend to use the stock to make vegetable soup. If the stock is to be used in other recipes, best to leave it salt-free and season it when used. Once cooled, refrigerate for no more than a few days or store, frozen, for up to 1 month. When using dry beans, you must take a few minutes to inspect them, looking for small stones and/or beans that are discolored or otherwise spoilt. Discard them. We’ve found that 1 cup (200 g) of dried beans per quart (950 ml) of stock will yield a soup with just the right “beans to stock ratio” in every bowl. You may wish to add more or less stock to suit your own tastes. Cooking times will depend upon the type of bean — canned or dried — that you use. If dried, the longer they are allowed to soak, the less time needed to cook. Even so, they will take at least 60 minutes — more like 90 — to cook fully. If canned, rinse before using and they should be ready to eat once they are heated through. Taste before serving to ensure that they meet your preferences. No listing of traditional Italian dishes served on Christmas Eve would be complete without mentioning eel. Yes, eel. Served on Christmas Eve almost exclusively, live anguille, eels, can be found in tanks at the largest and best-equipped Italian markets beginning around December 15th. You can learn how my family prepared the slippery devils by clicking HERE. The year’s last visit with Zia went very well, though I doubt I’ll ever drive North again when there’s a Polar Vortex rolling South. Once there, we cooked up a storm and 4 of those dishes will make their way on to this blog over the next few weeks. My Cousin, also, came up for a few days and he and Max were off roaming the countryside. With deer season just starting, however, the sound of distant rifle fire kept them both closer to home than normal. I do think he minded more than the dog. Max just wants to be at my Cousin’s side, no matter where that happens to be. Me jealous? Nah! It’s good to “pass the baton” every now and again, giving Zia and me time to make our pasta in peace. With November now behind us, Christmas will be here before we know it. Today’s recipe is a perennial favorite of my Christmas gift baskets. (They’re bags actually because I can never find gift baskets.) But I’m getting ahead of myself. Some 3 years ago, I began making ketchup following a recipe on Tanya’s fantastic blog, Chica Andaluza. About the same time, I made Guinness-based whole grain mustard from a recipe I found on Mandy’s wonderful blog, The Complete Cookbook. I honestly cannot recall which came first, the Chica or the keg, but that Christmas my friends and family got a jar of each in their “baskets” — well, almost. I’ve friends and family members who follow gluten and alcohol-free diets. 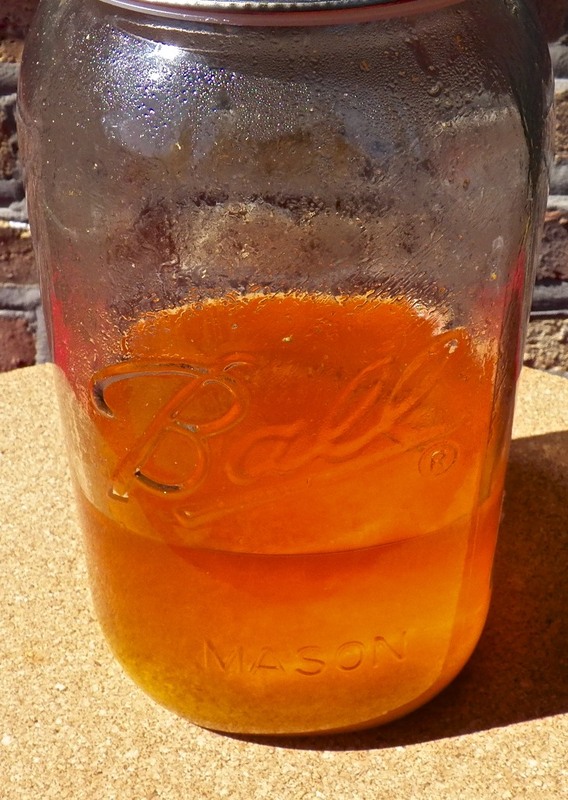 A mustard made with Guinness just wouldn’t do and so began my experiments with making honey mustard. Today’s recipe is the latest incarnation and is easy to prepare. It’s easily modified if you’d prefer it more or less spicy (see Notes), or, if there’s a particular flavoring you’d wish to include. Before we get to the recipe, however, there are a few things you need to know. Though there are over 3 dozen types of mustard seeds, yellow and black/brown seeds are most readily available in these parts. Of the 2, yellow mustard seeds have the more mild flavoring. Keep this in mind when you prepare mustard at home. The hotter the mustard, the more brown/black seeds you’ll need to add to the mix. 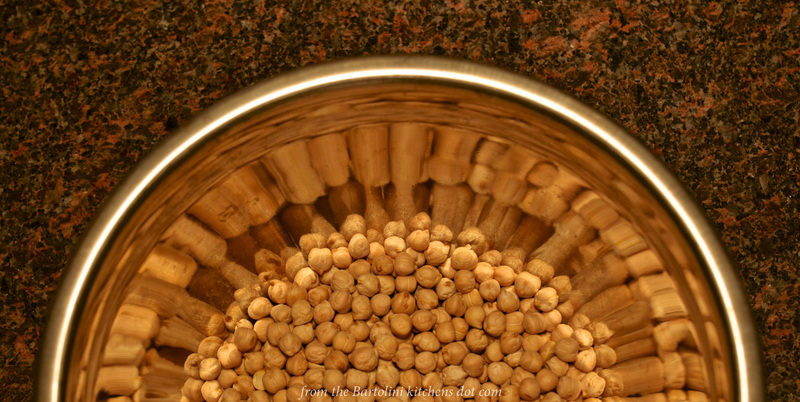 No matter which type of mustard seed you use, though, all will become milder if exposed to heat. That’s why today’s recipe is not processed in a boiling water bath for canning purposes. Just remember to keep it cold if you want it hot. Be advised, too, that this recipe also relies on oil as an ingredient. Canning when oil is being used is, at best, a risky endeavor. Be sure to check with a far more authoritative source than this blog before attempting to preserve this recipe’s mustard. Because this mustard is not processed, it must be kept refrigerated at all times. Be sure, also, to use jars, lids, and utensils that have been cleaned and, when possible, sterilized before use. The object is to reduce as much as possible the risk of contamination. Do so and your mustard will last for 6 months in your fridge. In fact, I just finished the last of a batch I made for Christmas last year. Though I prefer my mustard to be on the grainy side, you can make your mustard as smooth as you like. Be sure to keep an eye on your blender or food processor, however, if you’re making super-smooth mustard. Some models may overheat (see above) and you should give it a rest if the machine’s body feels too warm to the touch. Lastly, once prepared, stick your mustard in the fridge and forget about it for at least 2 weeks before using, though I wait a full month. This is to allow the flavors to blend and the mustard to mellow. Taste it beforehand and you’re sure to be surprised by its bitterness. Place mustard seeds and vinegar into a large container, cover, and set aside at least 8 hours or overnight — the longer the better. If need be, add more vinegar or water by the quarter cupful, to make sure none of the seeds remain dry. Place the now-soaked seeds, along with all the remaining ingredients, into the bowl of a food processor or blender. Process/grind the ingredients until fully combined and the mustard is the consistency you prefer. Remember to check the machine’s housing for signs of over-heating. 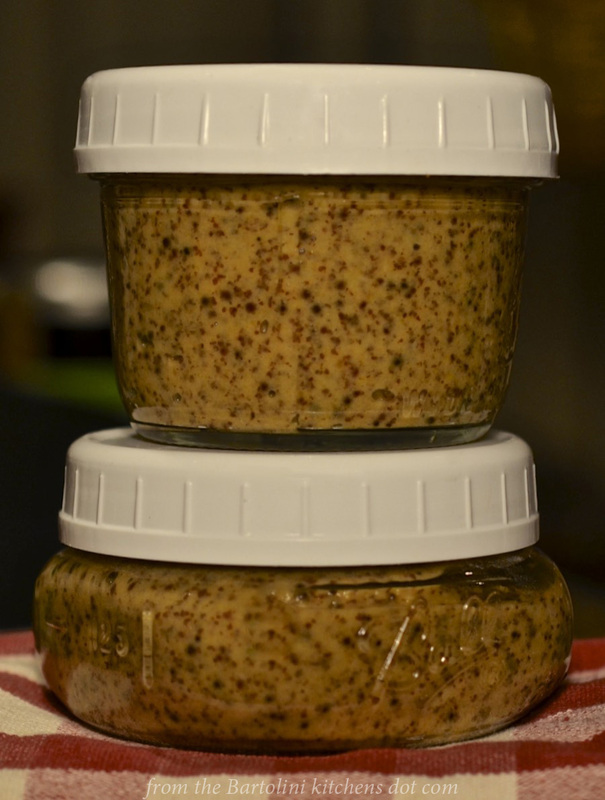 When ground to your liking, place the mustard in clean, sterilized jars and refrigerate at least 2 weeks before using. 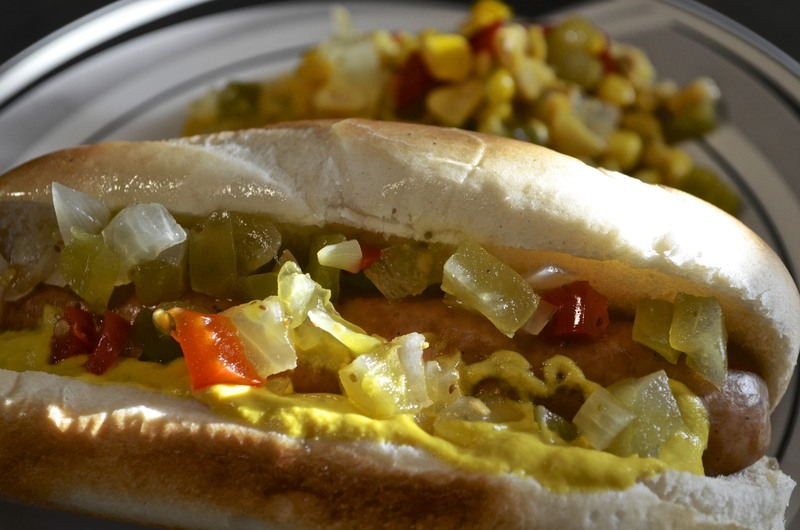 This recipe will yield a relatively mild mustard. For a spicier condiment, go to a well-stocked Asian market and look for Chinese mustard seeds. These are a little bit darker and smaller than our “normal” yellow seeds but do they ever pack a punch and will definitely add some heat to your condiment. If it’s too late to add more brown/black or Chinese mustard seeds, you can make your mustard spicier by adding red pepper flakes, cayenne pepper powder, or your preferred hot sauce. 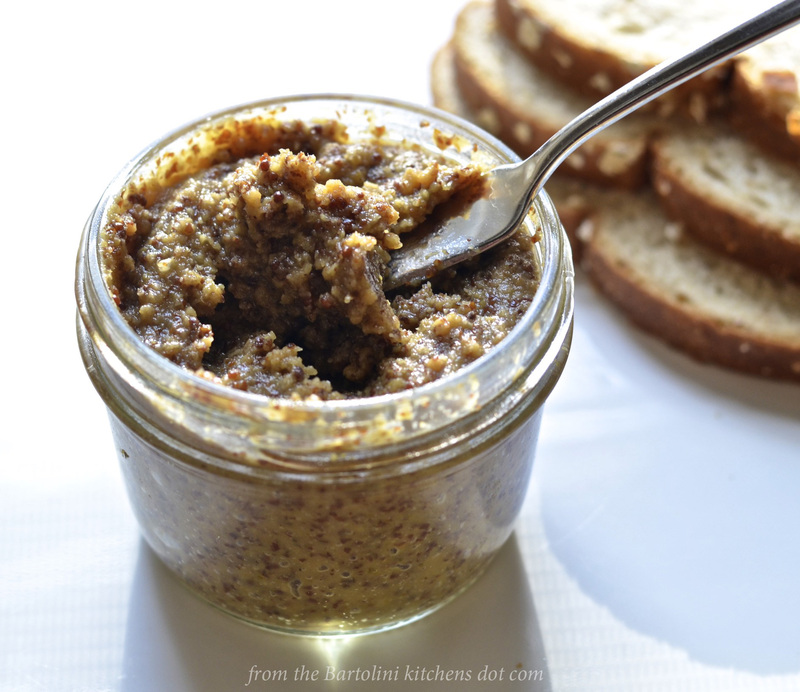 Avoid using fresh herbs and/or fresh chilies when making this mustard. They could be a source for contamination and the mustard’s shelf-life could be affected. If you cannot find tarragon vinegar, feel free to substitute whatever type of vinegar you prefer, flavored or not. You can use this mustard to easily make a mustard dipping sauce. Just add a few tbsp of mustard to about twice as much mayo — more or less to taste — and stir well. Season with salt, add as much honey as you prefer, and, if you like your dipping sauce spicy, add a touch of cayenne pepper or hot sauce. Refrigerate until ready for use. Those who have followed this blog for some time know that many Italians follow the custom of serving seafood for their primary meal on Christmas Eve. To that end. I’ve shared a number of seafood recipes that family members have served for that special meal. Today’s look back features a recipe that was prepared every year “Upstairs”, in Zia’s home. 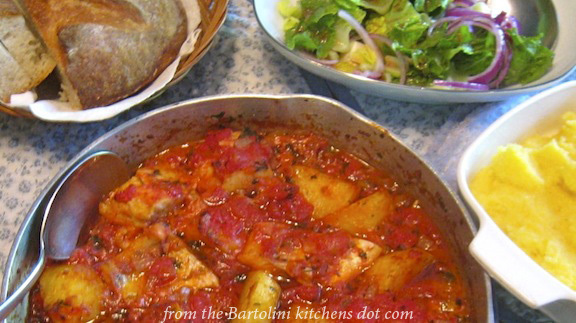 Stewed in a rich tomato sauce, the aroma of salted cod, baccalà, being served was sure to draw me to their table like a moth to a flame. You can learn all about the preparation of baccalà simply by clicking HERE. Oh, harissa! How do I love thee? This is another in the series of recipes dedicated to my new love, the ever so delectable harissa. I told you that I was harissa obsessed and today’s recipe is further proof. Prior to this, I’ve shared recipes for goat and for chicken cooked in harissa. Included in the latter post was a recipe for the spicy sauce. For that recipe, I trimmed away the seeds and ribs from all the chiles and said that I wouldn’t do it again the next time I prepared the sauce. And so I did, finding this batch to be more spicy than its predecessor and, this time, the heat didn’t completely dissipate during cooking. Perfect. So, armed with a fresh batch of harissa, I went searching for a new use. I didn’t have to go far because the internet is jam-packed with recipes using harissa. 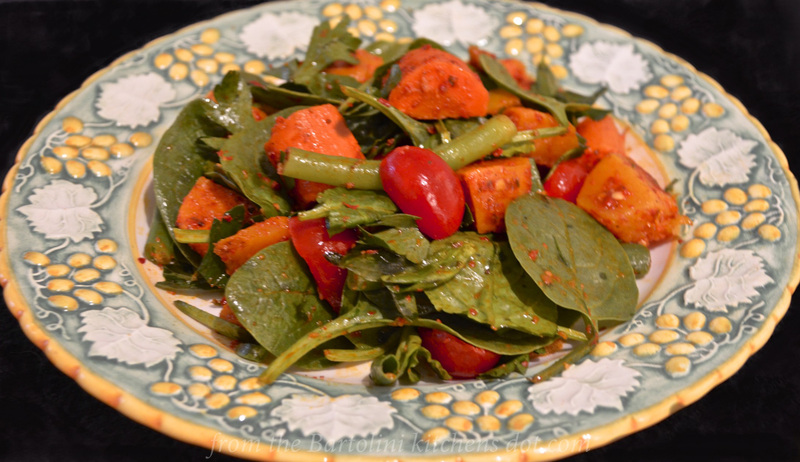 I eventually chose a salad with roasted vegetables, which should be popular with our friends to the Far South, where colder temps are taking hold. If you’re in the North, though, don’t let that dissuade you from trying this salad. I found it to be a perfect lunch for a chilly Spring day — and we seem to be having more than our fair share of those. Aside from using my own harissa sauce, I did make a few changes to the original recipe. In the first place, I halved the quantities. It’s a good salad but there’s only so much one person can eat. The cilantro/coriander was the next thing to go and in its place I used the leaves from a bunch of flat-leaf parsley. Once again, since good fresh tomatoes cannot be found, I used grape tomatoes that I sliced in half. I followed the rest of the recipe and was rewarded with a great salad, one that fits nicely into my plans to go meatless one day a week. In a small bowl, mix 1 tbsp harissa with 2 tbsp olive oil. 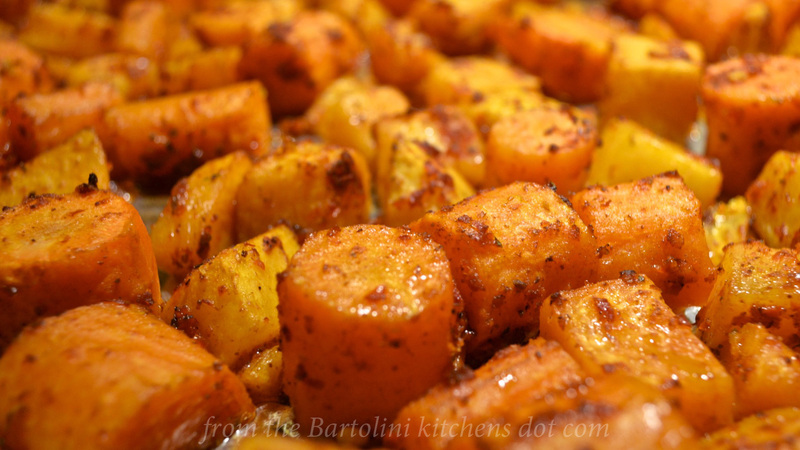 Place squash and carrot chunks in a large bowl and pour harissa-oil mixture over it. Mix to evenly coat the vegetables. Place on a baking sheet/dish, set on middle rack in oven, and bake until both types of vegetables can be easily pierced — 30 to 45 minutes. Remove and cool. Meanwhile, blanch green beans in a small pot of boiling water for 2 minutes. Remove and place in an ice water bath until needed. In a large non-reactive pot, add green beans, spinach, preserved lemons, tomatoes, parsley, and the now-cooled roasted vegetables. 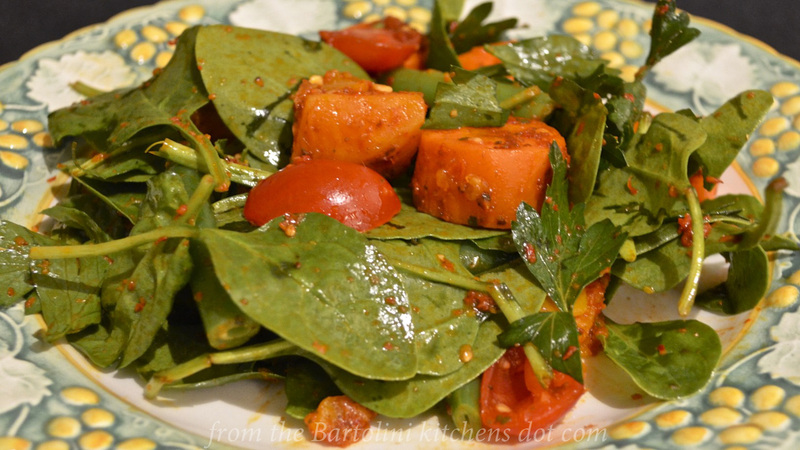 Combine remaining 2 tbsp harissa with 1 tbsp olive oil and use to dress the salad. Add more oil, if needed. May be serve chilled or at room temperature. From a recipe published in The Australian Women’s Weekly. How much oil you add will depend upon how thick your harissa is. Mine is rather thick, so, I add olive oil to make it easier to coat the vegetables and, later, to dress the salad. In all, I tried this recipe three ways. One is as you see listed above. 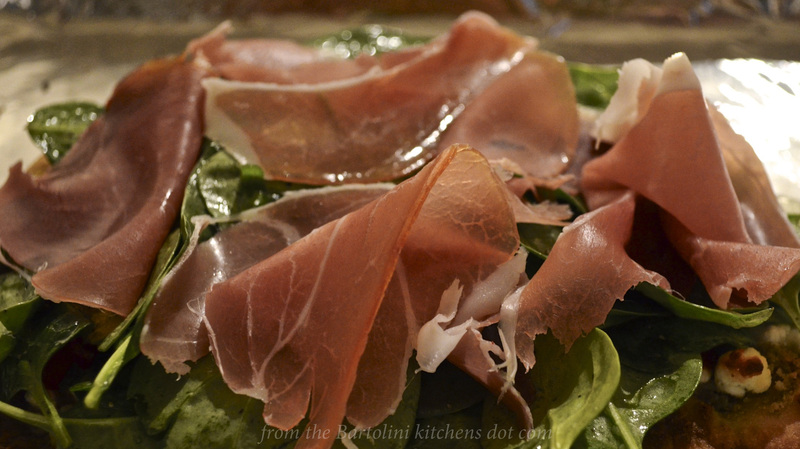 In another, I used baby arugula (rocket) in place of the spinach. I found the leaves weren’t strong enough to withstand the harissa dressing and wilted pretty quickly. The 3rd and last time was prepared without spinach and with half the amount of parsley. The result was a dish of roasted vegetables that make a perfect side for a roast. 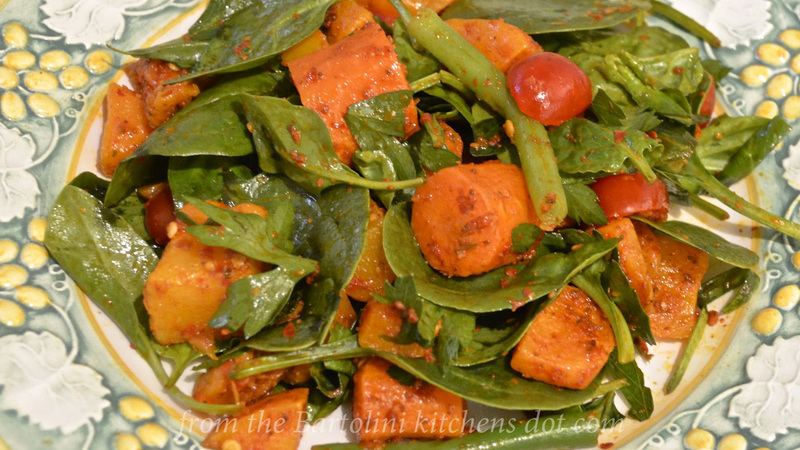 This version is definitely worth making again, perhaps adding additional root vegetables to the mix. I’ve found that my recipe for harissa yields 2 cups of the sauce, far too much for most recipes. Using an ice cube tray, I freeze the excess, placing the frozen harissa cubes in plastic bags until needed. It was about a year ago when I shared a favorite salad of my Grandpa, one simply made using canned tuna, anchovies, and sliced onion. 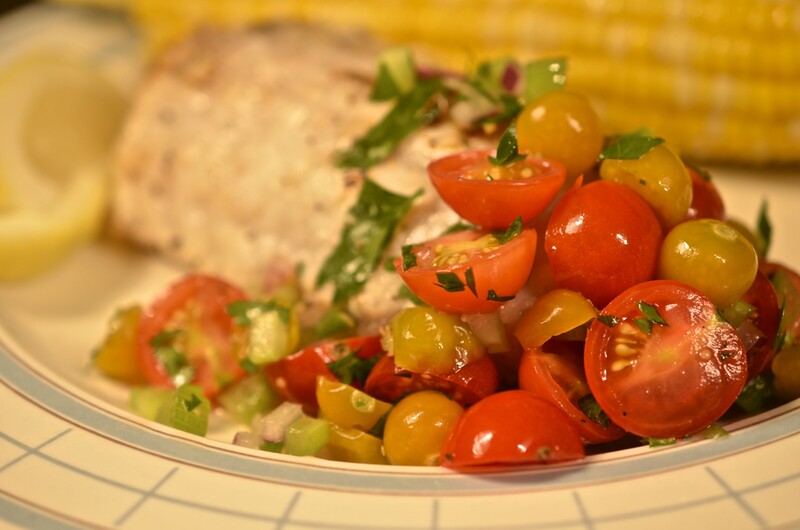 I included my updated version, which used seared tuna over a bed of salad greens. Both are lighter fare and equally tasty. You can see them both and decide which is best for you by clicking HERE. Almost everyone lucky enough to visit Italy will, at some point, sample Limoncello. 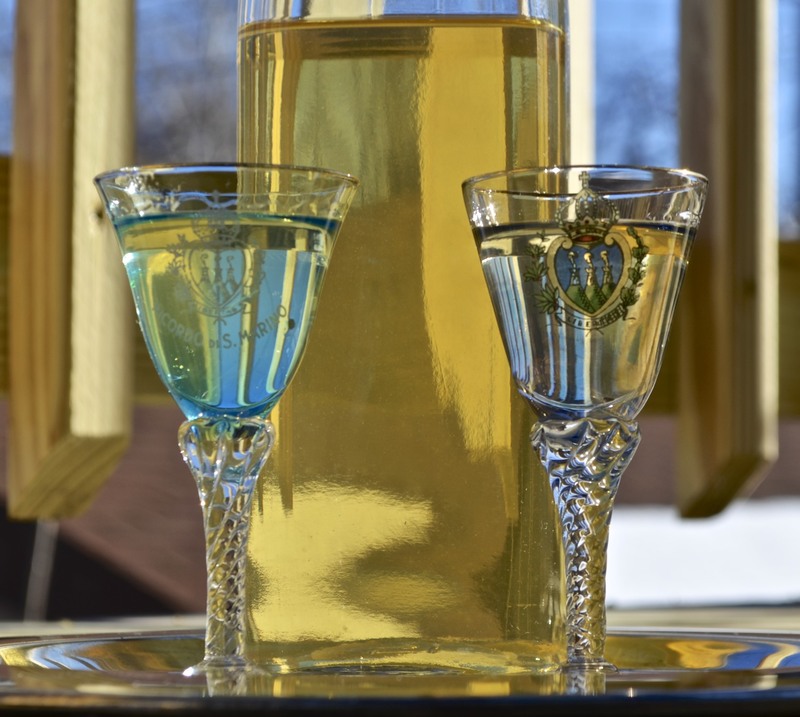 This lemon-flavored liqueur is often served after dinner as an aid to digestion, un digestivo, and, when properly made, Limoncello will have a strong lemony flavor without being bitter or sour like freshly squeezed lemon juice. Though many believe that the lemons that grow in and around Sorrento produce the best Limoncello, these lemons are not available here in the States. So, with no other options available, I’ve aways used “regular” organic lemons to make my Limoncello. This all changed, however, last year. For the first time ever, Meyer lemons were available in virtually every grocery store I entered. I’d never seen so many. Having read that Meyers were as close to the famed Sorrento lemons as one can get here, I decided to use them to make my Limoncello. Remarkably, at the very same time that I was collecting the Meyer lemons, the grocer was putting out blood oranges. Suddenly, I was buying blood oranges, too, having decided that very moment to make orange-flavored liqueur, Arancello, as well. With an eye towards this Christmas, I thought I’d,also, make lime-flavored liqueur and give all three as gifts. Since I only had 2 jumbo jars and both were already filled with zest and grain alcohol, I put off buying the limes until I’d emptied one of them. Once I got home, I checked my recipe for Limoncello, calculated how much Everclear (grain alcohol) I’d need for all 3 “celli”, and headed to my neighborhood liquor store. Want to have some fun? Go into a liquor store and buy about 1.5 gallons (5.25L) of grain alcohol. No need to answer when the clerk asks, “Will there be anything else?” A look will suffice. My “celli” recipes are similar to those that are available on the internet. One thing that I do differently from most is that I use a micro-plane to remove the zest from the citrus. Though most recipes say to use a peeler to remove the peel, being careful not to collect any pith (the white stuff), I find it quite difficult to do. The problem is that the more pith you collect, the more bitter the liqueur. By using a micro-plane, I keep the amount of pith — and bitterness — to a minimum and I’m done in half the time it would take me to “peel” the zest. Once you get passed the zest collection step, you’ll find the rest of the recipes to be straight-forward and you should have no trouble following them. On behalf of Zia and the rest of the Bartolini Clan, I’d like to wish you all a New Year filled with Peace and Joy. Place all ingredients in a large jar, cover tightly, and place in a cool, dark place. Shake contents occasionally — i.e., once per week. After 45 days, pour contents through a sieve to remove the zest. Cover tightly and return to a cool, dark place. After 2 weeks, filter the liqueur one more time through cheesecloth, or, for a very clear liqueur, through a hand strainer containing 2 coffee filters. 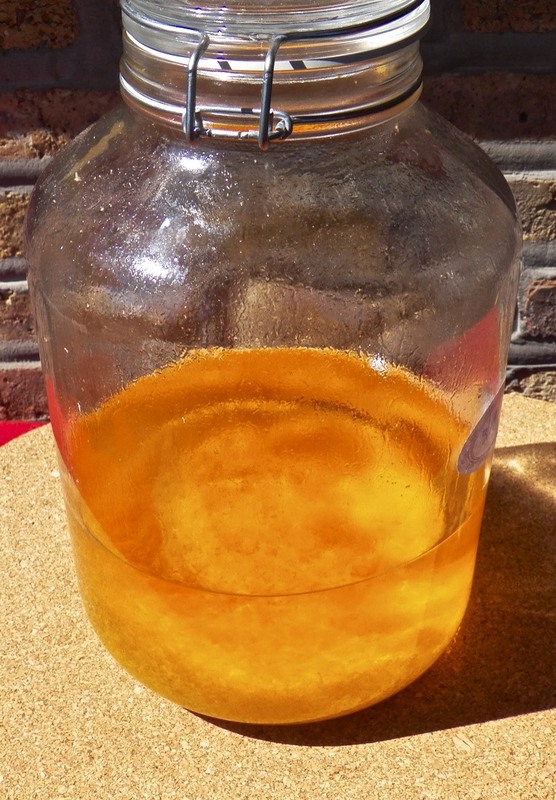 With 2 jugs of citrus zest flavoring the Everclear, I was looking forward to making lime-cello in the near future — and then I saw Siobhan’s post describing how to make cherry liqueur on her wonderful blog Garden Correspondent. (Do pay her a visit for a charming look at family life and gardening in Turkey.) Not long after, while returning from a visit with Zia, I stopped at a cherry orchard to buy tart cherries, some of which were destined for this liqueur. Lime-cello would have to wait. In a large jug with a lid, begin with a layer of sugar and then cherries, repeating both layers until the cherries are used up. Top off the jug’s contents with the remaining sugar. Seal the container and leave in a sunny location for 1 month. After one month, give the cherry mixture a good stir and add the spices wrapped and tied in cheese cloth. Re-seal the container and set it aside for another month. Add the liquor to the reserved cherry juice. Set aside in cool, dark place for 2 weeks. After 2 weeks, strain the liquid through cheese cloth or, for a very clear liqueur, through a hand strainer containing 2 coffee filters. 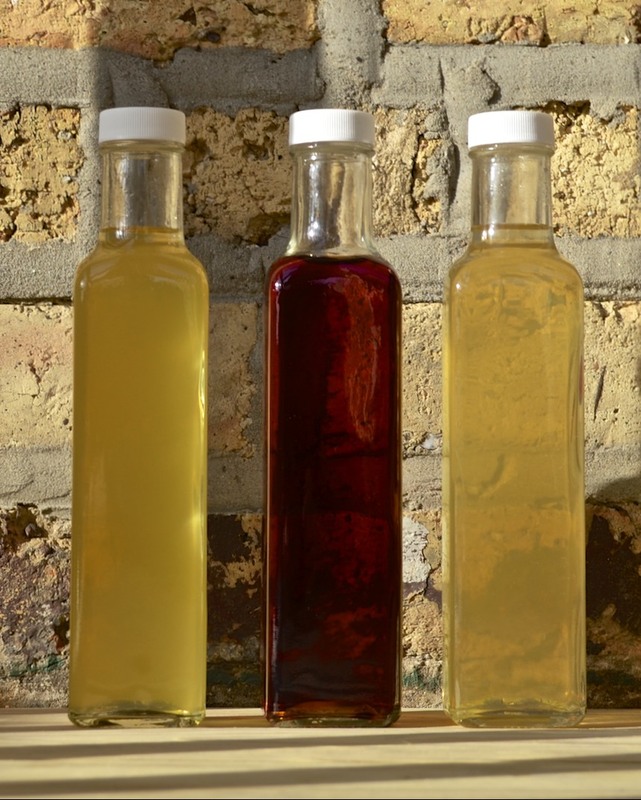 Like Limoncello, your tart cherry liqueur will continue to mellow as it sits. With thanks to Siobhan, Garden Correspondent, for the recipe. Although I used blood oranges and Meyer lemons to create my “celli”, you can use regular oranges and lemons just as easily. Do try to use organic fruit when available. As was mentioned, I had intended to make a 3rd “cello”, lime-flavored, but decided to make the cherry liqueur instead. Now that the gifts have been given and the large jars emptied, I may yet give lime-cello a try. Besides, I have to do something with that half-bottle of Everclear. So, you’ve made a batch of Arancello and are wondering what else can be done with it other than drinking it straight from the bottle. Coincidentally, earlier today a cocktail recipe using Arancello was posted on a fantastic blog, Feeding My 3 Sons. Not only does this blog feature great recipes, each is reviewed by 3 of the toughest critics in all of WordPress. Most of our citrus fruit is “protected” after picking with a light coat of wax. Be sure to use a brush under running water to remove this coating before attempting to zest the fruit. Everclear is grain alcohol and is very potent. (75.5% alcohol, 151 proof) It is dangerous to drink it “straight” out of the bottle. In the recipes above, it is diluted using spring water, bringing the alcoholic content into more acceptable levels. If you feel it is still too strong, simply add more water. If you cannot find Everclear or do not wish to use it, vodka can easily be substituted. When you do, there’s no need to add any spring water at all, though you can if you wish to dilute the liqueur. 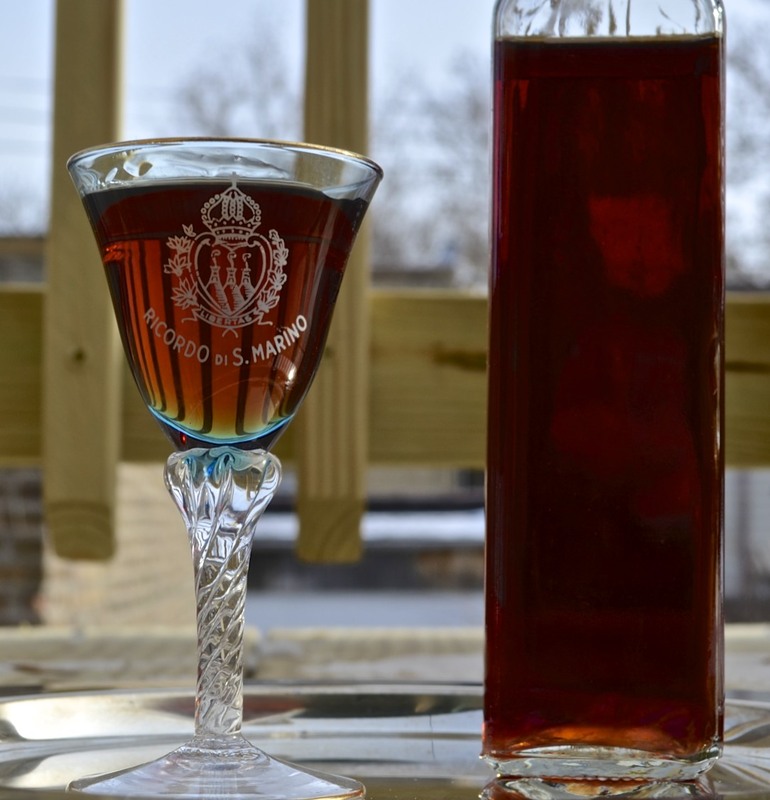 It is advisable that the liqueurs be filtered a second time before being chilled for serving. This will remove the tiniest of particles thus ensuring your liqueurs will be clear when served. 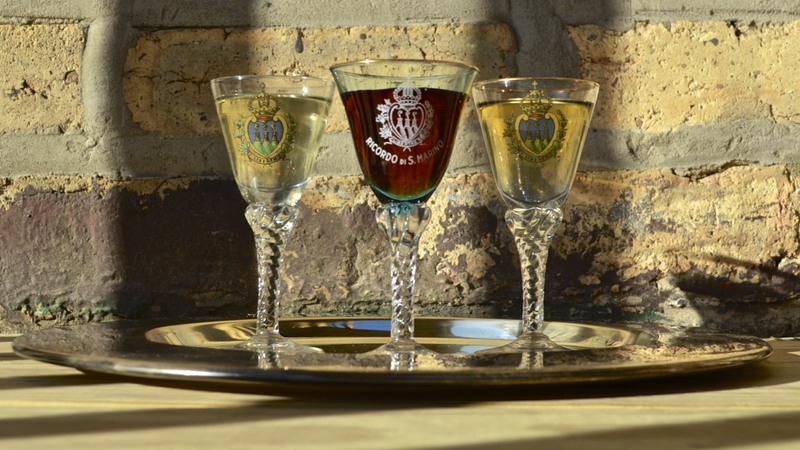 You will find that all 3 liqueurs will mellow as time passes. For best results, they should, also, be stored in your freezer for at least 1 week before being served. Patience is a virtue and you’ll be well-rewarded the longer you wait. Though you should discard the citrus zest once it is strained out of the liqueurs, you may wish to save the cherries. Though not suited for children, you may think of a few desserts in which to use them. Personally, I place them in jars that I then fill with vodka and store in the fridge. A couple of weeks later I enjoy them as-is or as a garnish in vodka martinis. Just be sure to warn your guests if there are pits in the cherries. Of course, after a few of them, no one will care. In January, I am going to celebrate a milestone birthday, the big SIX OH! Though I’ve nothing special planned as yet, there are a couple of projects, here at home, that I have neglected, using this blog as an excuse for procrastinating. Well, I’ve no intention of starting the next decade with these tasks still waiting to be completed and, as a result, the Kitchens will be closed for the month of January, reopening on February 5th. Thank you all for your ongoing support and encouragement. See you in February! To complete my review of Bartolini holiday dishes, today’s look back will feature our cappelletti recipe. Served for lunch on New Year’s Day, these stuffed pasta are traditionally shaped like the brimmed hats once worn by priests. Unable to produce enough hat-shaped pasta to serve our family, Mom’s cappelletti were shaped like small ravioli, raviolini. 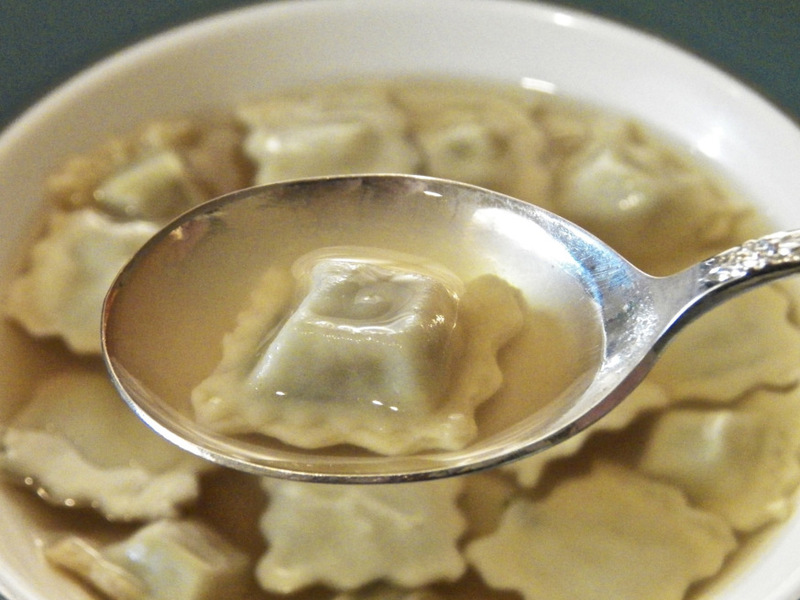 No matter their shape, cappelletti are usually served in broth, brodo, and are a delicious dish to serve on the First Day of the Year. 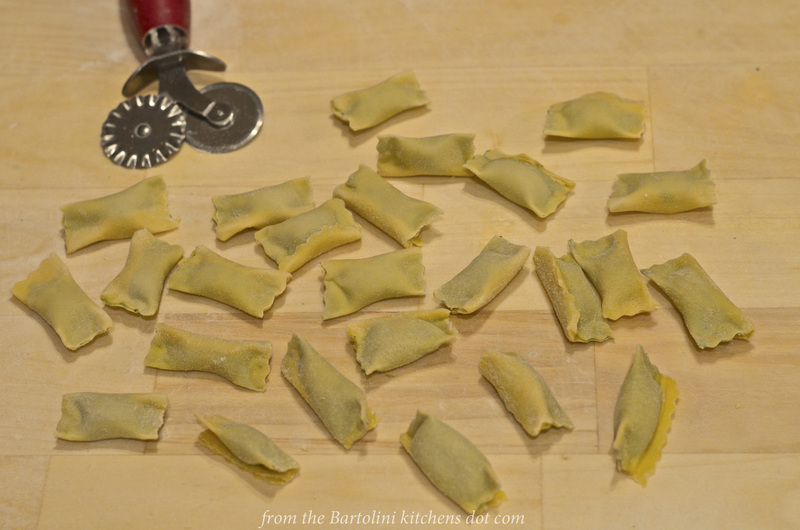 You can check out my family’s recipe for cappelletti simply by clicking HERE. Thanks to all who sent their condolences during the past week. My family reads this blog and I know that they were as touched by your thoughtfulness as was I. This has been quite a month and I hope you’ll understand if I’ve not been as frequent a visitor or commenter on your blogs as I have been in the past. Determined to return to the good old days, when I was rewarded with quarts of tomato sauce, last Winter I bought new planters. When, in the Spring, my seedlings looked pathetic, I bought heirloom plants from the farmers market, some of which were the same as my under-achieving seedlings. And then I waited patiently. Lo and behold, I was richly rewarded. My Brandywine supplied me the “T” for all Summer’s BLTs. My cherry tomato, Mexican Midget, insured my salads never went tomato-less and still yielded enough for me to make tomato jam. Finally, my plum tomatoes, San Marzano, kept me awash in tomato sauce. Grandpa would have been proud. 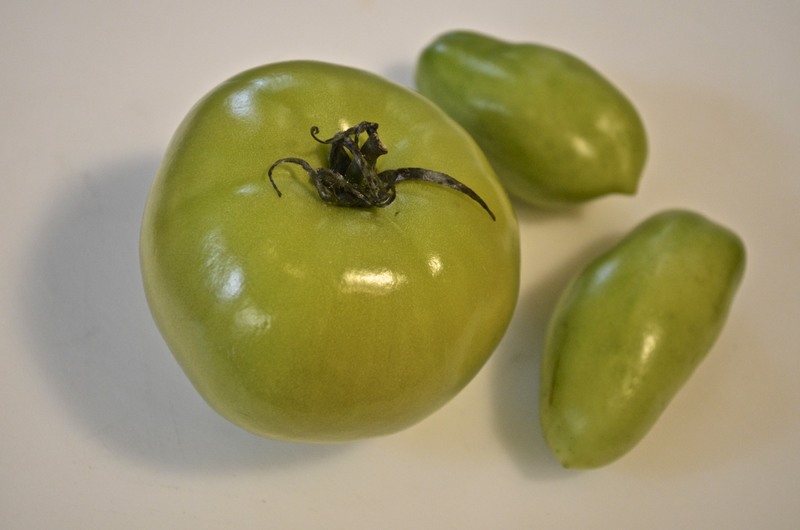 As October drew to a close, I went out and picked the San Marzano plants clean of green tomatoes. The other vines had all but given out at that point. Setting aside some to ripen on a window sill, I chopped the rest, rendering about 1 of the 2 quarts needed for the relish. I then bought 4 large green tomatoes at the farmers market. 3 were needed for the relish and the 4th, destined for BLTs, joined the others on the window sill. Searching the web for a recipe wasn’t as easy as I had thought. Most that I ran across required a number of large tomatoes without giving an associated weight or volume. As you can see in the photo, my tomatoes were varied in size and I had no idea how many would equal, say, “24 large green tomatoes”. The recipe I finally chose gave the ingredients in quarts required — equivalent metric units were, also, provided — and could be adjusted to suit the volume of tomatoes on-hand. It wasn’t long before my relish was underway. Today, Wednesday, the Jewish Faith celebrates the start of Hanukkah, while tomorrow we in the States celebrate Thanksgiving. Whether you celebrate the holidays, I hope your day is a good one. Have a Wonderful Hanukkah & Happy Thanksgiving! Relish, we are your father. Place tomatoes, onions, peppers, and jalapeños a large bowl and sprinkle with salt. Stir to mix and set aside for 1 hour. After the hour has passed, drain the liquid before placing the mixture into a large, heavy-bottomed pot. Add the sugar, mustard, celery seed, cloves, and vinegar to the pot and stir to combine. Heat the mixture over med-high heat until it boils. Reduce heat and simmer for 20 minutes. Place relish into sterile jars and fill to 1/4 inch of top and cover. Once cool, store in the fridge where it will keep for 2 weeks. For canning instructions, see Notes. It took about 6 large tomatoes to make 2 quarts chopped. Sizes vary and you may need more or less tomato to fill 2 quarts. This should be done while relish and jars are still hot. Bring a large kettle of water to the boil over high heat. Place a rack or towel in the bottom of the pot so that no jar will come in contact with the bottom of the pot. Seal each jar a little less than fully tightened. Place jars in the boiling water. Do not allow them to touch each other and the water should cover the tallest jar by at least 1 inch (2.5 cm). When the water returns to the boil, process the jars for 10 minutes. Remove the jars to a cloth-covered counter or baking sheet, away from any drafts. (The cloth will prevent the jars from shattering should they come in contact with a cold surface.) Do not move for at least 12 hours, though 24 hours is best. Relish stored in a cool, dark place should keep for about a year. Forget Moose. Must get Squirrel! One day last Summer, after listening to me yet again bemoan Squirrel’s daily raids on my tomato plants, my friend Cynthia mentioned that she’d heard that squirrels steal tomatoes for the moisture they provide. The squirrels will take a bite and a drink from each one that they pilfer. If you want to reduce the thievery, the theory goes, leave a dish of water for them to drink. I didn’t experiment with this because I had stumbled upon my own way of dealing with Squirrel — and a shot-gun wasn’t even involved. Every day or so, I walk around my plants’ containers, picking up tomatoes that have fallen due to the wind, Squirrel, or a passing Max. (He has a yard to patrol yet insists on circling each container.) One afternoon, while on my way out, I gathered up the tomatoes on the ground, placing them on a table on the deck — and promptly forgot all about them. The next morning, much to my surprise, a couple of the tabled tomatoes were stolen by Squirrel but those on the vine were left alone. From that day on, like my Roman ancestors of long ago, I paid a tribute of fallen tomatoes to my enemy, a four-legged barbarian, and my wealth, my tomato harvest, was spared. Only time will tell whether this arrangement will work next season. 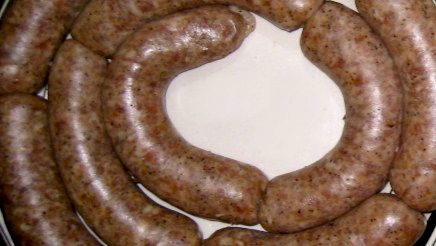 Fall is typically when a Bartolini’s thoughts turn to sausage making. The cooler temperatures make it far less likely to run into the spoilage problems that you might encounter in Summer’s heat. Not only that but years ago my family hung the freshly made sausage in their screened, back porches to dry/cure in the chilled air. Once cured, the sausages were sliced and eaten like salami. Well, despite all that — and the photo, for that matter — I no longer make sausages, preferring to make patties instead. 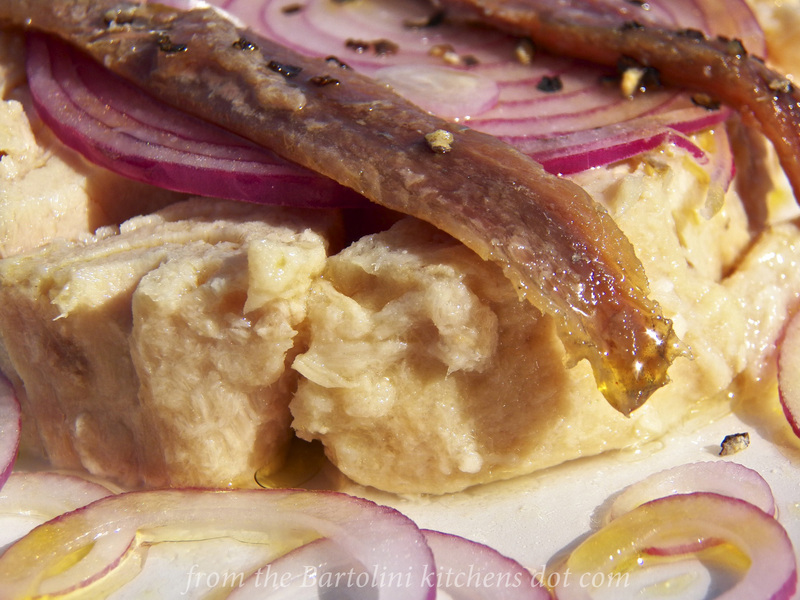 No matter your preference, you can learn how to make sausage like a Bartolini by clicking HERE. The Kitchens have gone from the blogging world to bookshelves and now to virtual libraries around the globe. 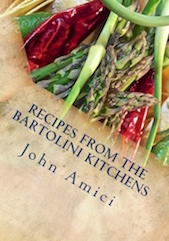 Our cookbook, Recipes from the Bartolini Kitchens, is now an eBook in Kindle format. You can learn how and where to purchase it on this blog's Cookbook page (located under the banner photo) or simply by clicking HERE. Happy St. Joseph’s Feast Day!!! !